"For the first time in 35 years, this chassis is ready to hit the track! When the anglewinders came along, I robbed the drop arm and the side pans off of this chassis and put them on the new chassis I had built. Well, that anglewinder is long gone and this partial frame has been shuffled from boxes to drawers and made several moves. I never had the heart to throw the frame away, but I never had the real desire to repair it, either. It was the formation of this web site and the great job Jim has done with it [Thanks! -TJA] that got me interested in bringing this broken frame back to life. Also, I still had the Champion 517 that I raced in it. So I decided to put it all back together, as close as I could to the way it was long ago." 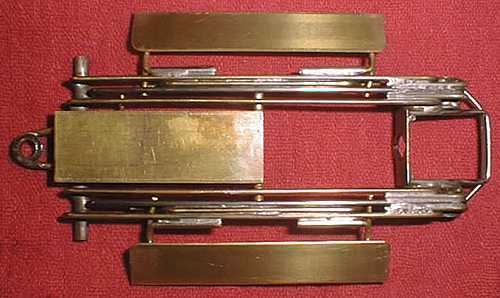 "I began the rebuild by cutting a 1/16" thick 1" wide brass strip for the drop arm. 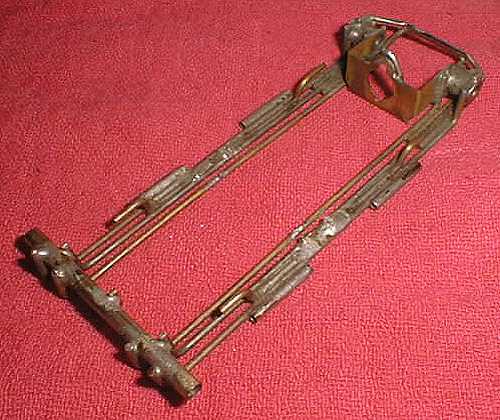 Next, I bent a U-shaped piece of 1/16" brass rod and soldered in a 3/16" i.d. collar from an old Champion drop arm for the guide flag. I soldered that to the drop arm. I then fabricated the drop arm hinge, from 3/32" tube and 1/16" rod and soldered it to the frame rails and the end of the drop arm. I then added the down stop, and the drop arm was done." "The side pans were cut from some 1/32" thick 1/2" wide brass strip. 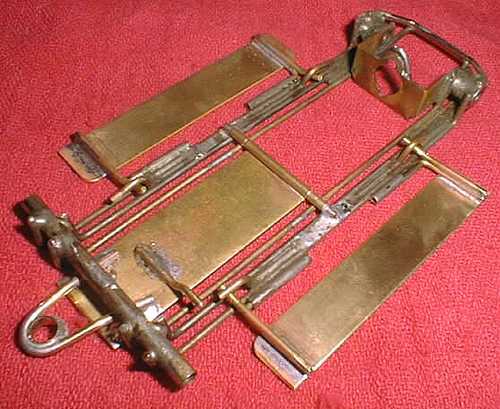 I bent four L-shaped 1/16" brass rods for the pans' hinges and soldered them to the pans. Then I cut four 1/16" tubes and soldered them to the tops of the brass rods. Why to the tops of the rods and not to the pans? This would keep the pin holes in the body a little higher, thus affording a little more durability. Ripped out body pin holes have plagued racers for years." 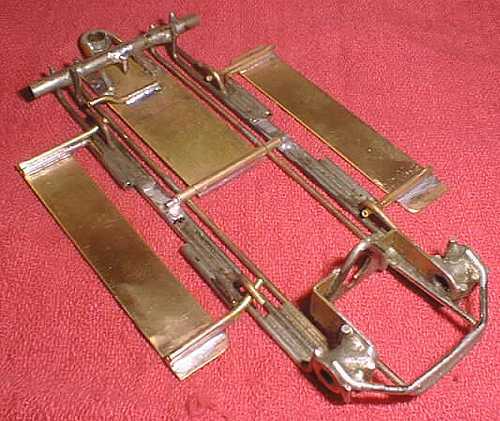 "The inside end of the body mounting tubes were bent upward to serve as the up and down stops for the pan movement. Floppy side pans were new at that time and we didn't know how much movement they should have, so I made sure there was plenty. If a little is good, a lot should be MUCH better! Yeah, right!" 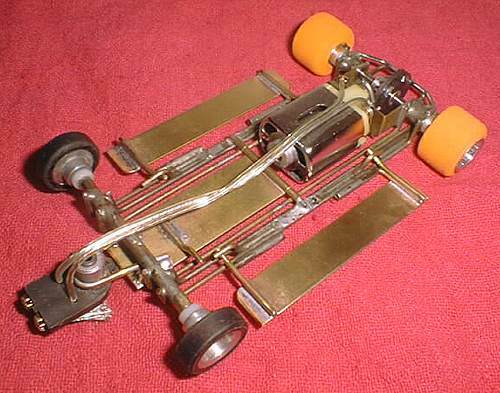 Below is the "AFTER" picture - a ready-to-race vintage chassis!